Homework does not have to be a nightmare! Kids crying, mom crying and still no homework done can be a thing of the past with these 5 tips for getting homework done. 1. To do homework, you must know what homework needs to be done. Be sure your child writes in his/her planner every day. It takes coaching your child about when to write down homework and to write it down each time it is assigned. This step is the most important because it saves hours. 2. Assign a spot for homework to be completed. Your child’s room is NOT the spot. A location just off the main hub of life in your home works well. Your child can ask for help if needed and you can gently supervise from not too far away too. Set up this station with a small caddy containing all the essential supplies. 3.Set a time for homework to begin. Homework time requires a time to be set. Your child needs a little time off and time to decompress. Having a start time that is non-negotiable helps everyone avoid procrastination. If your child has lots of after school activities, talk through the process and when homework will start. With both of you on the same page about start times, homework proceeds more smoothly and quickly. 4. Decide on your paper system for homework. Have a folder marked for homework, where the papers come home and return to school. Completed homework that is not turned in can be a major frustration. 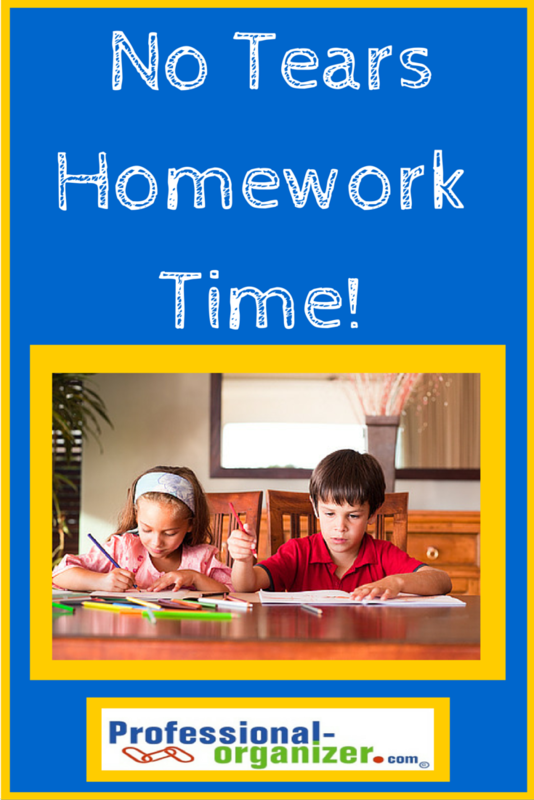 Be sure to check with your child to see completed homework in his folder before bedtime. 5. Use a timer if homework is dragging on and on. Some times distractions prolong homework. Set a small timer with a clock face at the work table. 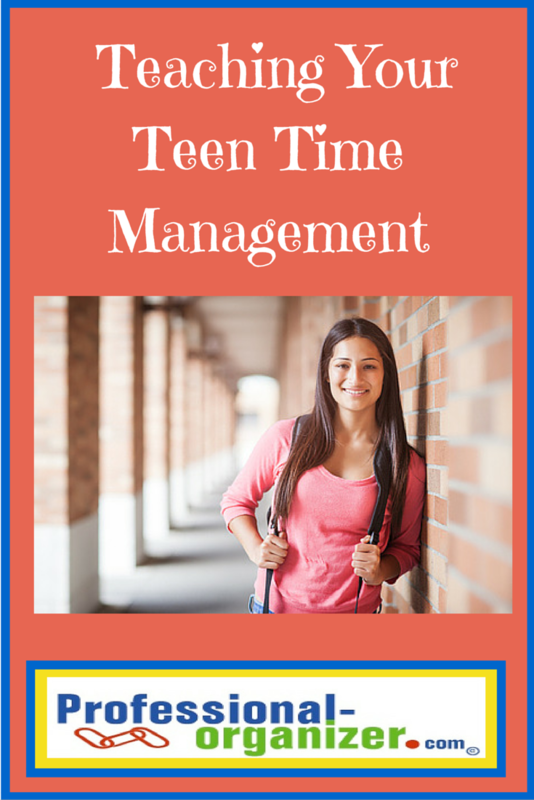 Have your child work for 30 minutes, then take a 5 minute break and then repeat the process. This way real work is being completed. What are your tips for getting homework organized? Join my newsletter for more student organizing tips. Student success depends on organization. That organization includes recording, planning and executing assignments. It requires attention and focus during school and after school. In the 21st century, education has moved beyond paper and pencil to technology in and out of the classroom. Apps are a great way to add organization to your student’s work. Check these weekly to be sure you are up to date. Getting your homework done is a matter of consolidating information. Students have to look on the board, check the teacher’s website and often look at other online spots. Using a homework app can help you capture it all in one spot. Skoach has an integrated task-list and calendar for student’s to coordinate classes, tasks and extracurricular activities. Just taking a photo with your smart phone of the assignments listed on the board and then recapping these on your paper planner can work too! Schools are starting to use technology primarily for assignments. In a recent Time article, textbooks and worksheets are stored in the cloud. Your student should be familiar with these apps to use at home and school to consolidate where they store their work. In Dropbox, students have access to documents on their computers, phones, or tablets. They can edit docs, automatically add photos, and work with videos. Evernote: Take notes, capture photos, create to-do lists, record voice reminders and makes notes searchable. Studying has taken on new options with apps. These apps are outstanding ways for students to use their learning styles. With not only visual, auditory and kinesthetic cues, apps make studying more focused, collaborative and interesting. StudyBlue is a collaborative tool for learning vocabulary and concepts. Quizlet helps students learn vocabulary. Essentials by AccelaStudy helps students learn a language. KhanAcademy has math and science tutorials. 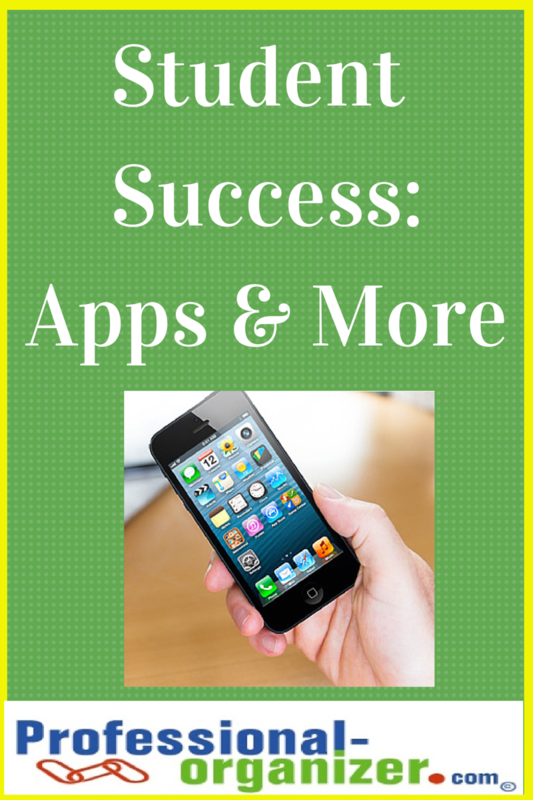 Have an app that has worked well for your student? More ideas for successful student strategies here. Is it surprising that a tiny book about the art of decluttering and organizing is on the New York Times best seller list for weeks? Vogue, Good Housekeeping and the Today Show have tested Ms. Marie Kondo’s Konmari method. It’s a topic and technique that has merit. 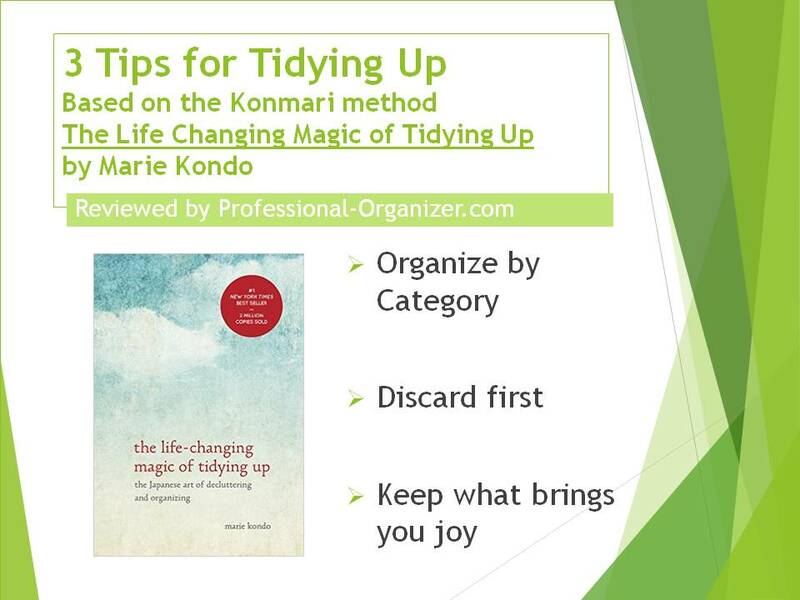 The Life-Changing Magic of Tidying Up is a best-selling guide to decluttering your home from Japanese cleaning consultant Marie Kondo. Three tips stand out for me in this tiny “how to” guide. It’s hard to know where to start your organizing. Using the Konmari method, start your work by category. A category can be a group of items that are alike or used together. In a disorganized space, it’s often the case that most categories are not grouped together. There may be more than one spot for school supplies, clothes, gift wrap or any group. You may have purchased items and these did not get put away or placed with similar items. Organizing by category works well. When you see all your items together, it’s easier to make decisions on what to discard. You know what you have and how many you have of an item. Once your category is organized, you must find a specific spot to place it as a group. Decluttering is always the first step in organizing. Once an item has lost value or function, it’s time to let it go. Often we think if we have better storage, if items were rearranged to fit better in a space, or we had more containers, we would be more organized. With the Konmari method, you are assessing and processing in order to release items. Ms Kondo asserts that this processing and dialogue is an inner conversation that focuses on what is important to you rather than others. The Konmari method helps us choose what we want to keep, not what we want to get rid of. Ms Kondo’s question is “does this spark joy?” The essence of each item in your home should bring a smile. Many items in your home are good, but are they good for you? It’s a lot to ask to have every item in your home bring you joy, but all your clothes and shoes certainly should. By releasing the items that we associate with guilt, shame or obligation, we are freeing ourselves to live our best life. The Konmari method helps you live your best life after putting your house in order. It’s simple effective strategies can transform your home and your life like magic! Sign up for more magic with my monthly newsletter. The school year starts off in a few weeks. It’s a mad dash from August to June with dates, activities, homework, dinner and more. As parents we are striving for a level of organization and sanity. 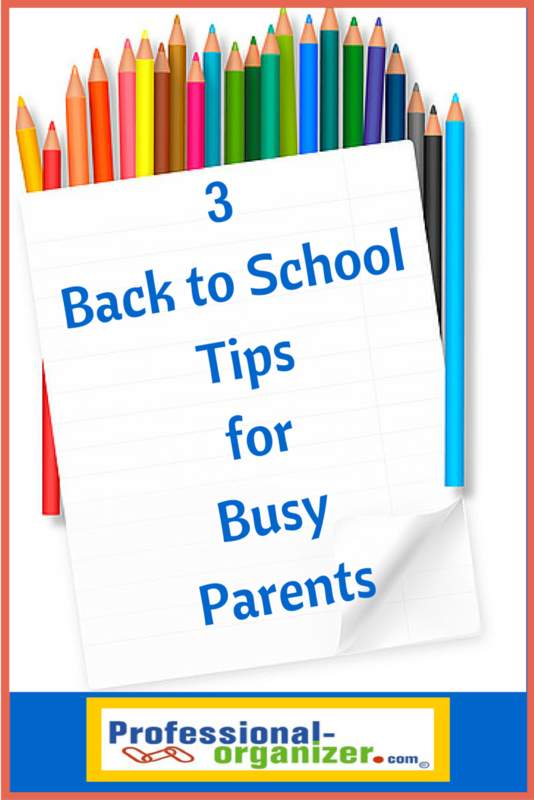 These three back to school tips will make your year more organized and less chaotic. Most of your kids invitations and information comes in through email and websites. It’s hard to consolidate it. Weekly planning time gives you the opportunity to search through email, school sites, teacher sites and other spots where that information is shared. Gather up your family calendar and task list, as well as a beverage of choice, and spend an hour gleaning information. It’s also helpful to sit with your middle and early high school students and make a weekly grid of their homework and after school activities. Choose your calendar that works best for you. If you love paper planners, use a paper planner. You can always shoot a photo and share it with your family. Cozi and Google calendar offer online real time access for everyone in your family. If you like auditory reminders, set your online calendar and “invite” your family for them to receive alerts too. Use what works best for you! There may be some eye rolling, especially from your spouse, when you mention a family meeting. You can call it the family huddle, gathering time or whatever you prefer. Hosting a time when everyone shares calendar events and family activities makes family efforts run smoother. There are always last minute things like baking cupcakes and purchasing poster board. But there will be fewer emergencies when you share during a family time. It’s hard to find a good time to meet after you are back to school. It’s in finding what works for your family that will make hosting your family meeting happen. Some families sit together after church on Sunday. Some families meet at 5 pm each Sunday. Decide when you can consistently meet and get started. It’s good to make this pay day for allowances too. Family time together can never be undervalued. A shared meal is the time for us to share our thoughts and feelings. But how to overcome all those distractions? Be realistic about your options. Even if there is only one time a week, set that expectation. Dinner time should be a no tech time for everyone, including parents. Try something new this year for family dinner conversations. 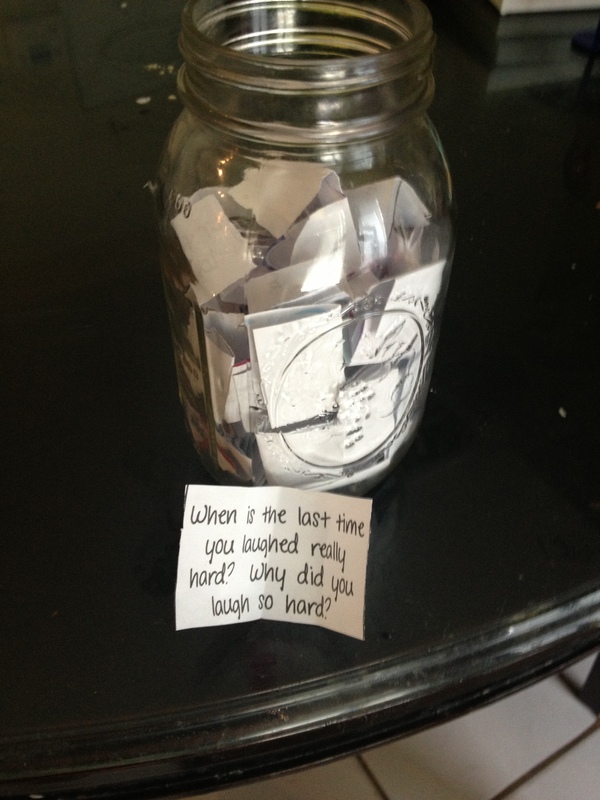 This dinner conversation jar is filled conversation starters. It’s a fresh take on that same old conversation. Wishing you and your family the best start to the best back to school ever! More tips for back to school here. Classes have already started in many places and around Houston. Football season is around the corner. 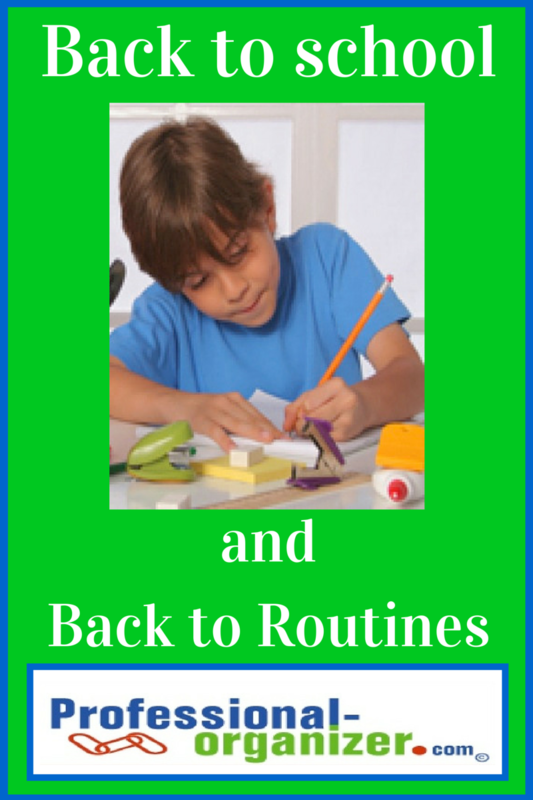 Knowing its time to get back to routines is part of the end of Summer and the beginning of Fall. Our routines may have faltered during the hot Summer, but these tried and true routines make a difference in easing our stress. Back to school means back to routines for moms, dads and everyone! It’s easy to get to bed later and later during the Summer. It stays light late and it is hard to wind down. Get started getting ready for bed earlier so you can get a great night’s rest. Most of us truly need 8 hours of sleep a night to do our best. There seems to be much more on our plate during this time of year. Make it easy with making lists. It takes a lot to keep remembering all that we need to do. Your list can be digital or paper. Write stuff down and then prioritize for the day. Stuff may get a little chaotic during the Summer. All of a sudden your closet, your supplies and your pantry are disorganized. Take a little time during August to get them back to their regular order. If you have clothes you have not worn all Summer, it’s time to donate them. Gather your office supplies together. Do you have a good routine for putting back your supplies? 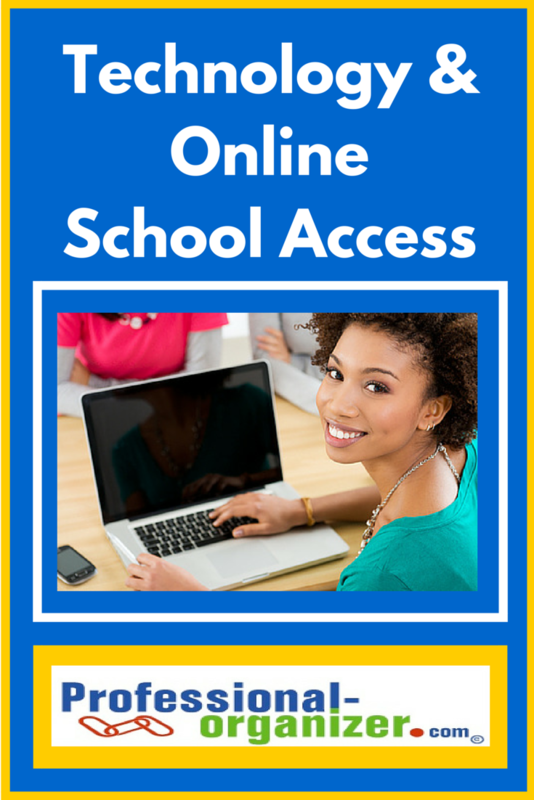 Simplify your access to items if you have trouble. Straighten items and review what is in your pantry. Create a checklist on paper or with an app to make shopping easier. Just giving each of these areas a little attention will make each day easier. Summer fun is often spontaneous, but Fall has lots and lots of activities coming up. Get back to the routine of entering dates in your planner as soon as you know them. Enter all dates from the school calendar, sports calendars, church calendars and any other activities onto your planner so these are all consolidated. Having all the dates in one spot makes it easy to see and know what is coming up. Check out my Back to School board on pinterest for other Back to School ideas.